Snowflakes like diamonds glistened as they fell. The air itself, cold and clear, was electric with anticipation, celebrating with us. Something magical was happening. Another fate had been altered, another divine being was on her way to Indraloka. There is nothing more beautiful than to watch hope rise out of despair. There is no greater blessing for us than to take the opportunity to stem cruelty with kindness, to tender love where once only fear resided. For as Rumi once wrote: "The ocean takes care of each wave until it gets to shore." Satya must have sensed the love with which we awaited her arrival. 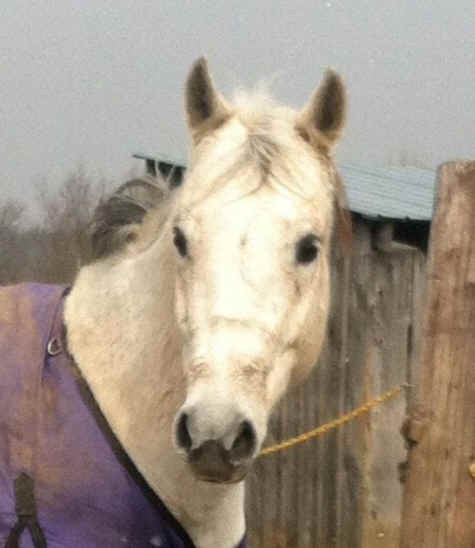 She jumped lightly off the trailer, nose quivering at all the new smells, and pranced confidently into the pasture. She was magnificent. Statuesque, with a soft coat of silvery-white. Her face looked sculpted, too perfect to be real. Her eyes, a deep liquid brown, were filled with soft light and kindness. It was clear that her outer beauty was merely a reflection of her angelic spirit. Her name came to us in a moment of utter truth: Satya. Eagerly, Domino and Quicker strained across the fence to meet her, nostrils flaring. We watched, enraptured, as they danced their ancient equine greeting, a ritual rich with timeless grace and subtle meaning. Satya’s club foot makes her unsuitable for riding or breeding. In most instances, horses like this would be auctioned off and then transported to Mexico or Canada to be slaughtered for human consumption. Satya, however, had the good fortune to find safe haven at Indraloka Animal Sanctuary. Her pronounced limp means nothing to us. We are happy to give her the best care, to make sure she will always be comfortable and content. We consider it our honor to do so. She is safe now, and has a loving home here for the rest of this life. I am often asked: Why bother to save just one, what difference does it make? Because we are each just one wave, yet we are also the ocean. One act of loving kindness brings light to a world of darkness and us closer to Truth. Welcome, beloved Satya. We will see you safely to the shore.